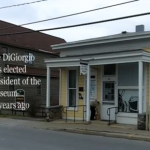 CANASTOTA, N.Y.–Joe DiGiorgio has been president of the Canal Town Museum here for the past 10 years, but his involvement with the museum goes back much farther. The lifelong social studies teacher helped found the museum in 1970 as part of a downtown restoration project. The museum recently acquired an original Watson wagon manufactured in Canastota in 1899 and plans to raise money for a display building especially for the wagon.